NDU/FCVW (Federal Consortium for Virtual Worlds), one of the earliest 3DXplorer adopters, has opened a new contractor position for an “Education Innovation Support” position based in Washington DC. To claim this spot, you need to prove your passion for interactive simulated environments. Best of luck to all the prospective candidates. Altadyn presented 3DXplorer in Washington D.C.
We were pleased to present 3DXplorer, to federal government managers and other visitors during the Federal Consortium for Virtual World (FCVW) annual event, at the National Defense University in Washington D.C., last week. The FCVW, also a 3DXplorer client, is using both the Meet-in-3D application (note the navigation bar on the home page), and the Online Meeting application for webinars. On Wednesday April 22, two dedicated presentation sessions, each during one hour, were the occasion to present 3DXplorer platform, the authoring studio, the avatar configurator, as well as the flagship applications of Online Meeting and Meet-in-3D to the participants who were also able to watch the creation of a new space in minutes and to ask questions in regards with 3DXplorer unique features, with a lot of interest and enthusiasm. On Thursday and Friday, participants could meet company’s CEO, Darius Lahoutifard, and discuss projects and ask questions. In the meantime several conferences and panel discussions were held in different halls at NDU and the main one was streamed live using 7 different virtual worlds platforms, simultaneously. 3DXplorer was the most accessible and the only one which was not requiring neither installation nor registration. Hundreds of visitors, could thus watch the conference program, live, without having to travel to D.C. The event was a particularly well organized one, with many valuable presentations and show cases of use of virtual worlds within the US government & defense segment, positioning the FCVW as the leading group in this space. 3DXplorer Puts Government Networking in 3D. FCVW goes live with 3DXplorer. 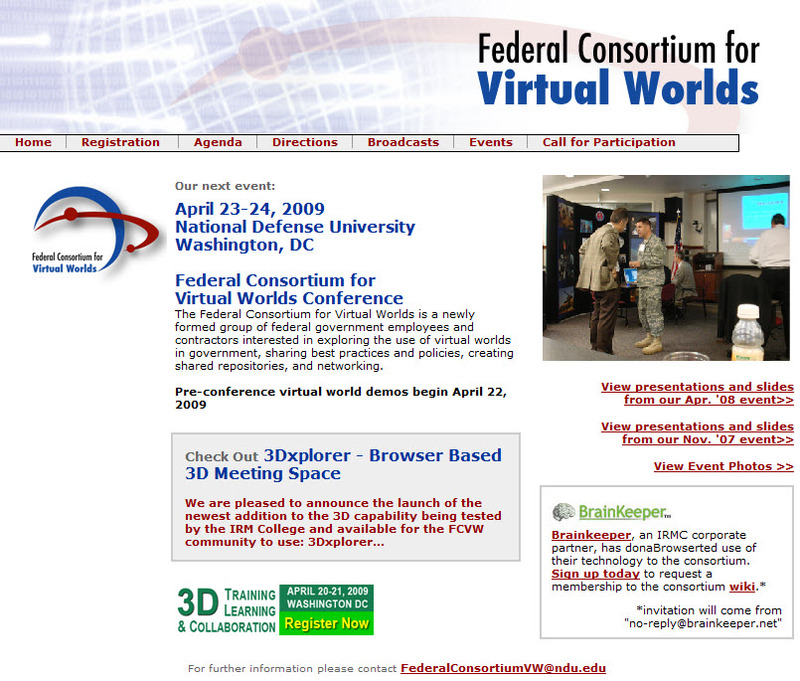 We are delighted to announce that the Federal Consortium for Virtual Worlds (FCVW), a group sponsored by the National Defense University (NDU)‘s Information Resources Management College (IRMC) who subscribed to 3DXplorer services during Q4/2008, went live with 3DXplorer Meet-in-3D application last Friday. To enter the FCVW’s virtual lobby click here. The Consortium has also set up a conference room for organizing webinars, using 3DXplorer Online Meeting application. Participation to conferences is on invitation. The FCVW’s membership includes government staff (federal, state & local, and international), various 3D vendors and academics interested in the development and use of Virtual Worlds in government. By using 3DXplorer’s Browser-based plug-in-less technology, FCVW contributes to an increased usage of Virtual Worlds and 3D spaces by the Federal government, thanks to higher accessibility and easier deployment.